I feel like we as a community are in a slightly weird place in terms of spoilers right now. 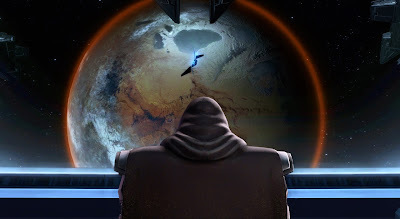 There is this big plot twist in Jedi Under Siege that's definitely more fun to experience as a surprise... but Bioware themselves are at this point talking about it very openly on their social media and it's even on the front page of the official website, so we should be able to talk about it as if it's nothing special, right? However, since I know that my blog has some readers who play the game more casually, who might miss even those signs and would probably still prefer to be surprised, I'll try not to spoil things for anyone a little longer by not having the big twist just show up in people's feeds without warning. Maybe I'll go back and change the subject line of the post later. Anyway, let's get down to business. You know now that there'll be spoilers! There are basically three things that I'd like to talk about in regards to the return of Darth Malgus. 1) Did I like it and do I think it's a good thing for the game? I've long said that Darth Malgus' "death" in False Emperor always struck me as a colossal waste. Last year I made a post called "11 NPCs That Died Before Their Time" and Darth Malgus came in at number two on that list. As I noted back then, it felt very weird that a character that had received so much build-up before launch was killed off before the game had even received its first patch. The fact that the original incarnation of the Malgus boss fight had you knock him off a ledge so that you never saw a body may have been a hint that Bioware was always planning to bring him back at some point, but it seemed to me that with six years having passed since then, that ship had long since sailed. When Bioware teased fans with that "deleted scene" from the KotFE trailer two years ago showing Malgus turned into a carbonite trophy for Arcann and Thexan, it left me completely cold. "Whatever", I thought. "Bringing him back at this point wouldn't really add anything." Yet when I first stumbled across a spoiler saying that Malgus was alive in Jedi Under Siege, I was instantly and unreasonably excited and I couldn't have told you why. I wasn't even sure whether it was true, as I had kind of come across it by accident and from the context it wasn't entirely clear to me at the time whether the information was even reliable. Do I think it's a good thing for the game? The one person on my Twitter who groused a bit about Malgus returning pointed out that it was a tired trope and in some ways a rehash of Shadow of Revan. And I can't say that they are wrong! But tropes aren't always a bad thing and I feel that in a way, Malgus' return is just what the game needed right now. Two years ago the notion didn't excite me, because it would've just been an easter egg in the story of the Eternal Empire. However, things are different now that we are finally moving away from that and returning to the Republic vs. Empire conflict that we all love about Star Wars. This was something that SWTOR handled very well at launch and for which Darth Malgus was very much a poster boy. Bringing him back now isn't just a random plot point, but rather serves to underline that we're going back to the "good old days" by literally bringing a beloved character from launch back from the dead. Not Quite Dead may be a trope, but it's the trope we needed right now. In that context, I also understand Bioware basically "spoiling" their own story on the front page. They made sure that the big twist was going to be a surprise for those of us who are actively playing every day, but now they are basically switching gear to using it as a marketing tool. 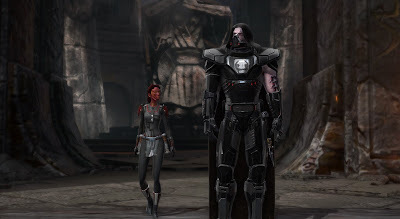 As I said above, Darth Malgus is a symbol of everything people loved about SWTOR at launch, and by shouting loudly about his return, they are probably hoping to reel some lapsed players back in who checked out during KotFE/KoTET because they didn't care about Zakuul. Honestly, I hope it works. With me being a die-hard Republic loyalist, I naturally played through the Republic version of the Ossus story first. In that, the reveal that Darth Malgus is alive comes very close to the end - and while I still enjoyed it for what it was, you receive very limited information about just what exactly is going on. It left me feeling eager to see things from the other side, though I still remembered Ilum all too well, meaning that I didn't necessarily expect to receive satisfying answers on Empire side either. Boy, was I wrong. On Imperial side, the reveal that Darth Malgus is alive comes as a surprise too, though more so to you as a player than to the rest of the Imps. As Major Anri puts it very amusingly, apparently tales about Darth Malgus being alive had been making the rounds for a while, but most considered him a sort of bogeyman used to ensure that good little Imps brushed their teeth and ate their vegetables. Still, the big reveal worked perfectly for me. The scene in which Darth Malora paces before the mysterious supply drop she's just received goes on just a little too long, with the camera slowly changing focus from her to the crate, and just as you start to wonder whether maybe someone is listening from inside... out pops Malgus! My first playthrough on Imperial side was with my Marauder, who's been my "dark side story main" since KotFE, but other than that I don't usually enjoy playing her very much to be honest. That said, she was a great fit for this particular bit of story and it just felt perfect. 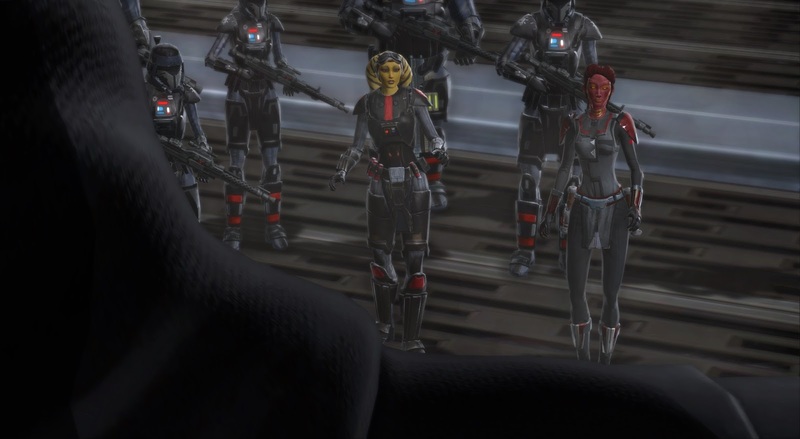 I loved how she was the only one to not bow to Malgus and how you're even given the option to mock him, in that way Sith are wont to do when they are trying to get each other's goat. However, he totally doesn't take the bait, which is also very much in character with the Malgus we know from back in the day, who was very goal-focused and not easily distracted by anger. (During some of the flashpoint intro quests you can give slightly stroppy replies along the lines of "Well, why should I care?" and he always has a good response.) There's also some interesting dialogue with Anri in the aftermath of this where she thanks you for not making a scene with Malgus, because we all know what it's like when you put two or more powerful Sith into the same room, which was another nice acknowledgement of my character's base class and also underlined once again that Anri has a very good understanding of Sith power dynamics. However, the best part is undoubtedly the bit closer to the end when you reunite with Malgus in the temple and he asks you to team up with him against the Jedi occupying the area. My first reaction was :"Squee, Darth Malgus is my companion! ", immediately followed by: "Oh wait, I'm gonna set him to heals now and he'll just wave his hands around and channel purple lines at me, and that's gonna feel a bit undignified for him, isn't it?" However, it seems that someone at Bioware wisley anticipated this, so they coded Malgus to not act like a normal healer. He jumps around smashing things up regardless of what role you set him to, and if he's supposed to be healing, you just receive heals somehow while he's smashing things to bits. I don't know how it's supposed to work but I didn't really care either. It was a great way of letting you really enjoy the feel of the team-up without making it impractical. We also learn during the story that Darth Malgus' current role is that of the Emperor's/Empress' Wrath, so for my Marauder the added dimension of old and new Wrath teaming up really hit the spot. However, it's also made clear that Malgus did not volunteer for his current role. He looks anything but pleased when he's being told that he'll soon be prepared for his next assignment, and frankly the fact that he was dropped off on Ossus in a box like a slab of meat instead of being allowed to arrive on a shuttle like a normal person doesn't indicate him receiving a great amount of respect from his new boss. His new codex entry explains that it was Acina who rescued him from certain death, and it's implied that she has pretty tight control over him (presumably due to the cybernetic enhancements she gave him). If Acina is dead in your story, Vowrawn is supposed to be the one pulling the strings after her demise. I do love the idea of Acina having been behind all of this by the way. I really liked her in KotET, but I also couldn't quite shake the feeling that she seemed maybe a bit too nice for a Sith. I love the idea that underneath that agreeable exterior she's been running some extremely devious schemes and side projects the entire time, and it makes her rise to Empress that much more believable. What we learn about Malgus' current state on the Imperial side of the story is very intriguing. His basic character traits still seem the same, but at the same time it's very obvious that he's not entirely in control of his own actions, which raises the question of what he's really thinking throughout the entire thing. When he expresses a desire to work with you, is that just him trying to keep you sweet because it's what he's been ordered to do? Or is he genuinely interested in your character, maybe even seeing the Alliance Commander as a possible future ally? Does he actually believe in the future of the Sith Empire again or would he still love to break away if given the chance? There are so many ways this could do, and ironically my biggest fear is that because we are free to imagine a thousand different outcomes for this situation, whatever Bioware actually ends up going with might end up feeling disappointing simply due to its practical limitations. In the immediate future (story-wise) I would expect our characters to fight against or by Malgus' side some more, but then what? Will he be able to break free? If so, will Imperial characters help him? What could Republic characters get to play through to match the sheer potential awesomeness of that? Or is it going to turn into another "sorry, but I hate you all" situation like on Ilum? There is so much potential here, but unfortunately also much room for things to go wrong. How did you feel about Malgus' return and where would you like to see his story go next? Personally, I would happily have taken more of Malgus over 'Keeping up with the Valkorions', or contrived/gratuitous Revan fanservice anyday. It frustrated me that you couldn't join him in the False Emperor flashpoint. I do feel that both him and Satele, never really recieved a satisfactory level of focus or exposure in the game. Especially since they were essentially the mascots for SWTOR. Still, I'm hopeful that this new expansion is an indication that they're finally getting their act together. Though it remains to be seen. But this is the kind of direction I wanted them to go in for a long time. I agree that Satele also didn't feature as much as one would have expected at launch, but at least she contributed something to both the knight and consular class stories on top of her role as a flashpoint intro quest giver. The way they threw Malgus away at the end of Ilum was just weird. I believe it's more in regards to the whole splitting Revan into two entities thing. Which I stil can't work out (or to be precise can't be arsed too.:P). And in all fairness to Satele, She's kind of flat in comparison to Malgus, outside her relationship to her son. I'm mixed on it. On the one hand, I'm a big Malgus fan. I think he and Lana are both excellent examples of how to make Sith compelling characters instead of leaning on the bloodthirsty megalomaniac stereotype. Malgus is ruthless, but also pragmatic and thoughtful. As an Imperial loyalist, he's the face I want for my faction, and I agree we should have been able to side with him during False Emperor. That said, while I love the idea of bringing him back, I don't love how it's been handled. It's way out of the blue without enough foreshadowing beforehand or development after the fact. We are in the middle of the story right now, so my complaints may fade as things evolve. In the long run Malgus' return is probably a net win. It just could have been handled a bit better, I think. Right now it just feels like shameless fan service. I suppose I don't mind the "out of the blue" aspect that much because our characters have now spent 5+ years (I'm not sure how much time is supposed to have passed during KotFE and the following story arcs) away from their original factions and it makes sense that they'd be a bit out of the loop. I think I would have been disappointed if we hadn't run into some surprises upon getting re-involved. My one small criticism for 5.10 is that the Imps get Malgus back and on the rep side of the story his return is basically a throw away comment in a cutscene. I wonder if they'll balance things by having Satele come out of seclusion and take a prominent role on the republic side. In some respect the return of Malgus is the type of motivation that could bring her return. Whatever they decide to do going forward I hope that the repside is equally as cool. I think it was my Guardian who brought up Satele during the conversation with Daeruun, and he replied that he contacted her but she couldn't help him because it's been years since she led the Jedi, which makes me think that her time in the limelight is supposed to be over. But I agree that it will be challenging for things on Republic side to live up to the sheer coolness factor of having Malgus back on Imp side. Thank you for putting [spoiler] in there, which meant I could skip reading it. Ilum is important because for Imps it's the first time they learn that their Emperor is (supposedly) dead! Though again, what a casual way of delivering such news... that and Malgus' push for more alien inclusion in the Empire became an ongoing theme. I fully agree that the delivery was badly bungled from a storytelling point of view though. Malgus is fine and all. But I honestly just want Darth Marr back as a companion. I don't care how contrived. Force ghost companion, haha! But nah, as much as I liked Marr, he had a good run and I'm happy to move on as far as he's concerned. Oh yes, I want Marr back as well! Sorry, but I completely disagree with you, Shintar. Malgus's return is great, especially with the mystery surrounding his "conditioning". I do have a fear that we'll focus so much on Malgus that we'll forget about the Alliance commander. For a Bounty Hunter or an agent, this is not a problem, they can go on being a highly paid independent, and it's all good. My Sith lords are another story. My Sith Alliance commander's are proper dark side "want to rule the universe" type Sith. For four whole seconds, we were living the Sith dream! Then came the entirely necessary walk-back of our God-like infinite empire. Just because we've had a setback though, I don't want to give up the dream. If you're a Sith who wants to rule the world, the next step is obvious: Dethrone Acina/Vowrawn and become the next emperor! What I'm afraid is going to happen instead, is that we'll be relegated to our "old" role as helper, and our Alliance and ambitions will not be mentioned. If we're Darth Malgus's little helper it will be extra weird, because we beat him on Ilum. Think how cool it would be to betray someone who thinks we're helping THEM become emperor. Come on, Bioware, make it happen! I have to admit I don't quite get your position here. (Or maybe you're joking and I'm not quite getting it right now... it's late.) You agree that the power level to which we rose as Alliance Commander was too much, but want to get to rule the Sith Empire instead? How wouldn't that create the same kinds of problems? The Eternal Empire was depicted as being strong enough to overrun both Sith and Republic effortlessly. If we're going to have a "proper" Jedi vs Sith war, both sides need to be roughly even. If we're already aligned with the Empire, then it's Empire and Alliance vs the Republic. If you make the Commander the new Emperor, it's "still" Empire and Alliance vs the Republic. So the overarching narrative can continue with this "small" detail changed, as the sides are still roughly even. Thanks for clarifying! I still don't think it would work though, as I feel the problem with the Alliance wasn't just it's eventual OP-ness, but also that having the player character essentially be a faction leader severely limited the kinds of stories you could realistically tell. That would still be a problem if you somehow crowned yourself the new Sith Emperor. I feel you Nickster! From an RP perspective, my marauder wanted nothing more than to stab Acina in the back and usurp the Empire during KOTET chapter 2. For him, it was still all about "Imp vs Pub." In such a circumstance, the Alliance would simply become the new Sith empire, which would be used to crush the Republic once and for all, and he would rule the galaxy as Emperor. On topic though, while I am not a fan of the "Not Quite Dead" trope, I did like how the return of Malgus was handled and am really curious to see how he plays into story in the future.